Cleansers and Debriders help to prevent infections. Our cleansers are safe and gentle on the skin. Debriders are great for removing excess exudate and slough. We also carry Coloplast's Baza Cleanse and Protect, which is a soothing cleansing lotion that can also be used for incontinence protection.. Wound Cleansers and Debriders including Biolex, Carraklenz, Sea Clenz, Wound Cleanser, Povidone Iodine Solutions, Debrider, Wound Wash, SAF Clenz, Baza Cleanse, Allchlenz and Barrier Cream. 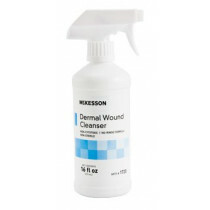 Wholesale wound cleansers and wound wash.